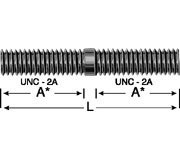 Studs too short for given thread lengths are threaded as close to center as possible. If the studs listed do not meet your exact requirements, ask for a quote on specials. Thread sizes up to and including 1-1/2" in diameter. In UNC, UNF, or metric series. A 1" A 1-1/8" A 1-1/4" A 1-1/2" A 1-3/4" A 2" A 2-1/4" A 2-1/2"
A 2" A 2" A 2" A 2-1/4" A 2-1/2"